Voltage drops can be calculated in advance using the right equations. 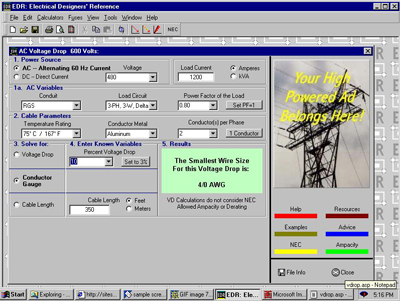 A voltage drop calculator determines the amount of electricity in single phase systems produced or consumed when electric current flows through the voltage drop. Voltage drops are measured in a circuit with an appropriate instrument, but also can be calculated in advance using the right equations. It is used to estimate cable line to line voltage drop when determining the proper sizing of electrical conductors. There are a lot of VDCs on the internet and one of the best places to find them are at Google Play. The calculation assumes uncoated copper or aluminum conductors in ac systems operating at the temperature selected and is based on the ac/dc resistance or impedance from NEC 2005 Tables 8 and 9 for stranded conductors operating on a DC or AC 60Hz system. The full load ampacity of each conductor size in the dropdown menu below is based on NEC 2005 Table 310.16 for 60C insulated conductors rated 0 through 2000 volts with not more than three current carrying conductors in raceway, cable or earth with an ambient of 30C (86F). Note that the actual ampacity and voltage drop for your application may differ from these results but in most cases will be very close to those shown here. Units herein are American Wire Gauge (AWG) and English (feet). This is a calculator for the estimation of the voltage drop of an electrical circuit based on the wire size, distance, and anticipated load current. Please note this calculator assume the circuit is operate in a normal condition—room temperature with normal frequency. The actual voltage drop can vary depend on the condition of the wire, wire cross sectional area, the conduit being used, the temperature, the connector, the frequency etc. It is recommended that the voltage drop should be less than 5% under the fully loaded condition.